Philip Pullman is a children's writer with obvious talent who can write in a variety of styles and for different age groups. 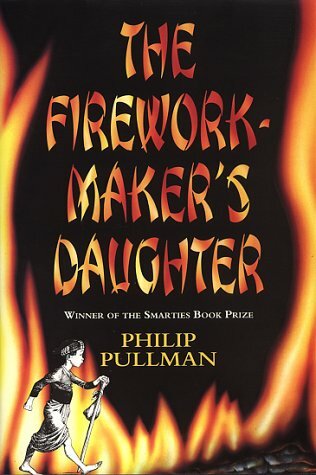 The Firework-Maker's Daughter is reminiscent of a traditional folk story. The hero, in this case Lila, sets out on a quest to discover a secret which will enable her to fulfil her greatest ambition - to become a firework-maker. She has to overcome obstacles, face dangers and prove herself worthy of the secret. All this she does, coincidentally helping others to fulfil their ambitions, with naive confidence and determination. She passes her final test and everyone is set to live happily ever after. One might expect a modern audience to be blaseŽ about such a well tried and tested formula, but not so. Pullman's story has pace, the characters are appealing and the stylish black and white line illustrations help create atmosphere. I would have said this title had appeal for boy and girls of about 11 as it is quite long and the typesize small, but my copy has been passed from hand to hand in a class of less able 14-year-old students. Perhaps that, as much as anything, is testimony to Philip Pullman's art as a storyteller.